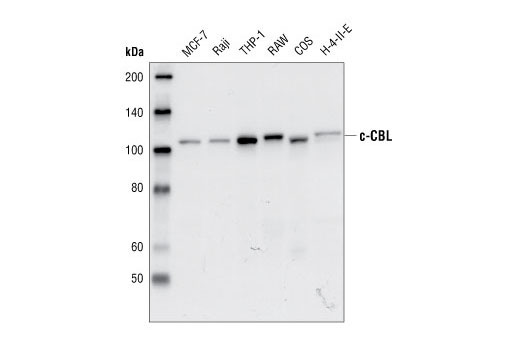 Western blot analysis of lysates from MCF-7, Raji, THP-1, RAW, COS and H-4-II-E cells, using c-CBL antibody. 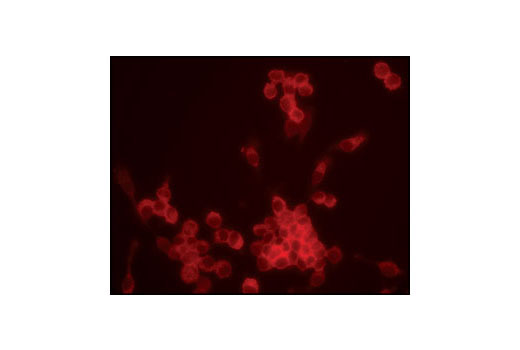 Immunofluorescent staining of paraformaldehyde-fixed RAW cells, using c-CBL antibody. This antibody detects endogenous levels of total c-Cbl protein. The antibody may also cross-react with Cbl-b protein. Polyclonal antibodies are produced by immunizing animals with a synthetic peptide corresponding to the carboxy terminus of human c-Cbl. Antibodies are purified by protein A and peptide affinity chromatography.